Very Good. 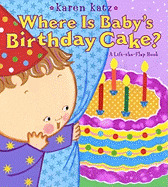 Where Is Baby's Birthday Cake? (Lift-The-Flap Book (Little Simon)) by Katz, Karen. Glued binding. Paper over boards. 14 p. Contains: Illustrations, color. Lift-The-Flap Book (Little Simon). Intended for a juvenile audience. Good. Where Is Baby's Birthday Cake? (Lift-The-Flap Book (Little Simon)) by Katz, Karen. Glued binding. Paper over boards. 14 p. Contains: Illustrations, color. Lift-The-Flap Book (Little Simon). Intended for a juvenile audience.